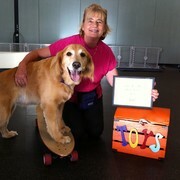 Just want to thank you Lisbeth and also Bev and Karen for the excellent training that Lily and I have enjoyed so much. I know Lily has enough for a pass now but we really are aiming for distinction. We are working hard at home as well to see if we can get this. Lily is so improved now. My husband says that in the mornings when he is playing ball off leash with her that she no longer runs at other dogs, she just ignores them now. I noticed when I took her to another trainer in the summer she was always panting and anxious. At Cowichan Canine she is just so happy and cannot wait to get in the door. It is her favourite place so obviously what you are doing is right and the place has great vibes for dogs. She has not reacted to the dogs in the classes either but is always wagging her tail. I am very grateful for this. We will be back in December and want to go onto greater things in advanced and we are both looking forward to it. Going to bring my other dog Cole as well.